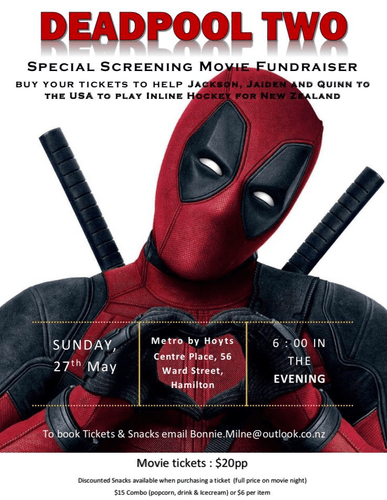 Three families have arranged to host a Special Screening Movie Fundraiser for Jackson, Jaiden and Quinn for their trip to USA to play Inline Hockey. These three Inline Hockey Players have been selected to play for the New Zealand 16U Inline Hockey team and they travel to California, USA in June to compete in the 2018 Narch West Coast Finals Inline Hockey Tournament. This is the first time for all three players to travel internationally to represent their country. As you can image, we are extremely proud of their hard work and dedication. Movie starts at 6pm and pre-ordered refreshments are handed out upon arrival and confirmation of tickets. Discounted snacks are available to order when purchasing your ticket. Limited seating so book now and don't miss out. It intends on being a great night and a lot of laughs. We all intend to be there to meet & greet and say Thank You in person. We also send our appreciation and thanks for supporting this fundraiser.